Setting up a root account and password is one of the most important steps during your installation. The root account is used to install packages, upgrade RPMs, and perform most system maintenance. Logging in as root gives you complete control over your system. The root user (also known as the superuser) has complete access to the entire system; for this reason, logging in as the root user is best done only to perform system maintenance or administration. Use the root account only for system administration. Create a non-root account for your general use and use the su command to change to root only when you need to perform tasks that require superuser authorization. These basic rules minimize the chances of a typo or an incorrect command doing damage to your system. To become root, type su - at the shell prompt in a terminal window and then press Enter. Then, enter the root password and press Enter. The installation program prompts you to set a root password for your system. . You cannot proceed to the next stage of the installation process without entering a root password. The root password must be at least six characters long; the password you type is not echoed to the screen. You must enter the password twice; if the two passwords do not match, the installation program asks you to enter them again. You should make the root password something you can remember, but not something that is easy for someone else to guess. Your name, your phone number, qwerty, password, root, 123456, and anteater are all examples of bad passwords. Good passwords mix numerals with upper and lower case letters and do not contain dictionary words: Aard387vark or 420BMttNT, for example. Remember that the password is case-sensitive. If you write down your password, keep it in a secure place. However, it is recommended that you do not write down this or any password you create. Do not use one of the example passwords offered in this manual. Using one of these passwords could be considered a security risk. To change your root password after you have completed the installation, run the passwd command as root. If you forget the root password, see Resolving Problems in System Recovery Modes in the Red Hat Enterprise Linux 6 Deployment Guide for instructions on how to set a new one. 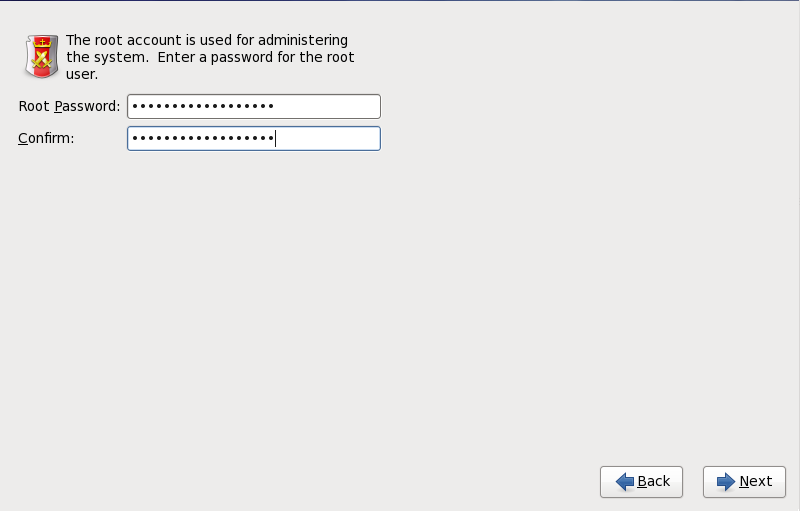 A root password is the administrative password for your Red Hat Enterprise Linux system. You should only log in as root when needed for system maintenance. The root account does not operate within the restrictions placed on normal user accounts, so changes made as root can have implications for your entire system.